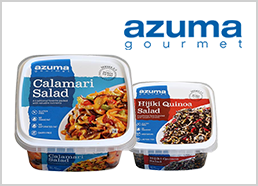 Results for "Lobster Roe Paste" | Azuma Foods International Inc., U.S.A.
Add Lobster Roe paste to any canapes to give it great look with great palatable in one bite. The thin slice of Yellowtail, film of olive oil, parsley, top off with Lobster Roe Paste will create a very delicious and appealing plate. This pure Lobster Roe Paste will make your sandwich into a mouth-watering dish in any minute. Adding Lobster Roe to shrimp will recreate ocean on your palette.